My aim for this work is to draw attention to what we are eating and why are we eating certain foods. There is a focus on cheaper foods and how people on lower incomes are altering their diets due to increased food prices and their financial circumstances. Baked beans are a cheap food source, allowing people on low incomes to obtain sustenance affordably. Janine Antoni was a big influence for me while creating this piece. She experiments with lard and chocolate as materials to create sculptures; inspiring me to think about what foods we have access to at home and how they can be used as an artistic medium. 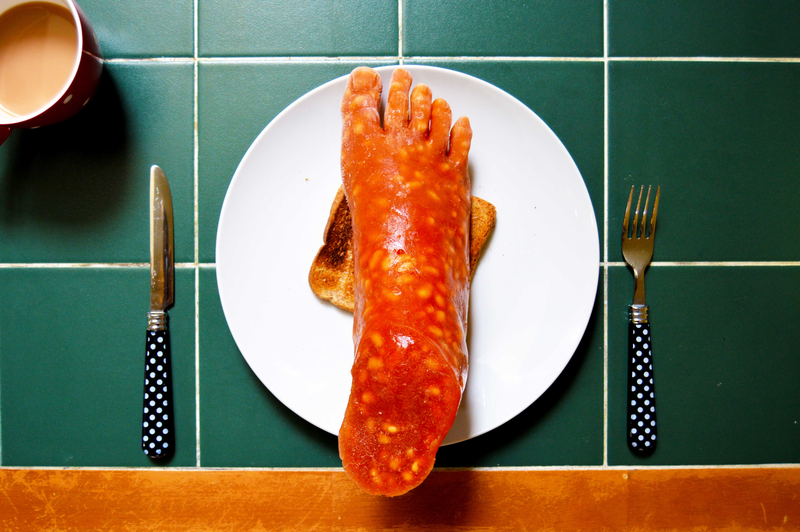 Beans On Toes also comments on how as a first world country, we have the option to create artwork using food, due its abundant nature. And that we throw so much of our food away, while many people in other regions of the world are starving. My work attempts to communicate to the viewer the greed of ‘developed’ societies and how attitudes of both companies and consumers leads to this mass wastage of food.